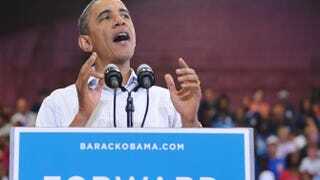 President Barack Obama speaks during a Labor Day campaign event Sept. 3, 2012, at Scott High School in Toledo, Ohio. But increasing voter turnout is insufficient in and of itself. For the black community, the deeper issue is the lack of black candidates running for office. A new Pew Research Center report shows that black Americans are much less likely than whites to seek elected office at any level. Of the only 2 percent of Americans who have ever run for office, 82 percent are white and only 5 percent are black. While registration drives and increasing voter participation are worthwhile efforts, in a republic, representatives speak for the people. As such, voter-turnout campaigns must be combined with candidate-turnout initiatives—it’s just as important for black communities to identify and encourage citizens to run for office as it is to recruit new voters. But why is it important that black candidates run for office? First, as mentioned, descriptive representation increases voter turnout. This is especially important because of the exceptionally low national turnout for local elections. A Fair Vote report cites a 2013 study that found only about 25 percent of Americans vote in their mayoral elections—the 1999 race for Dallas mayor had turnout of just 5 percent. Second, black elected representatives more strongly and effectively carry the message of black voters to government entities and the policy apparatus. At the state and local levels, this means having black voices in the room to represent community concerns on issues such as voter-identification laws, law-enforcement oversight, school-districting and funding plans, gerrymandering of electoral districts, and appointments of local officials. The issues that hit closest to home are often decided in local boards and state legislatures. Lack of representation there cedes our concerns to those who do not necessarily prioritize our communities. And third, the grooming process for national elected office starts at the local and state levels. In order for black America’s policy concerns to become national priorities, it is imperative to supplement economic, electoral and social power with the presence of black elected officials who can ensure that wider considerations are given to the impact of national policies on black communities. To this latter point, admittedly, the barriers to running for national office are substantial. It takes a large fundraising effort that usually requires candidates to dip into personal resources to fund the campaign. Fortunately, the local level is where a significant increase in black candidates has the potential for the most immediate impact. And it is critical to increase engagement there. The Root’s Charles D. Ellison describes the issues that abound when a black community either abandons or is disenfranchised from the political process. Turnout suffers and, thus, descriptive representation is nearly impossible. But the vote alone is not an end unto itself. If it were, the disparities that have existed since literacy tests and poll taxes were the means used to keep black folks out of the voting booth would have long since disappeared. But the disparities persist. To take another step forward in making our voices heard, facilitating access to the ballot box must be accompanied by enabling black presence on the ballot itself. Theodore R. Johnson III is a former White House fellow. His writing focuses on race, society and politics. Follow him on Twitter.